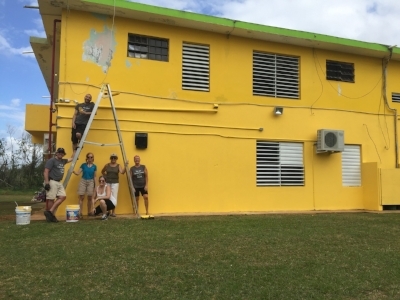 Usually you can find me painting fabric for stoles for Carrot Top Studio or painting on paper for my #100dayproject (#100DaysOfPaintedPages on Instagram) but ten days ago I was painting really large walls in Puerto Rico. While on a mission trip with my church we spent two days at Hogar de Ninos: Regazo de Paz. This special home cares for up to 15 children that have been abused. They focus on love and repairing the whole child. Their ministry is wrapped in prayer and we were honored to brighten up their exterior and playground with new paint. A surprise was meeting a Carrot Top Studio client who saw the location of our painting in a Facebook post and stopped by to check it out! How cool is that? A year before Rev. Danilie C. Hilerio Villanueva was to be ordained she had a vision for a stole that reflected her much loved Puerto Rico. It was wonderful to have the images we created come to life as I experienced this beautiful part of God's creation. With wonderful hospitality we lodged at Camp el Guacio in San Sabastian. It is a Presbyterian church camp and conference center that has a long, vibrant history on the island but has also physically seen better days. To help revamp their facilities we took on the clean up of three cabins. The photo above is of part of the group removing a bunk bed that would have it's metal scraped and the plywood supports saved for window coverings for the next hurricane. You can see that we were in the mountains .... it was so lush and beautiful despite that storm rolling in. One evening we had the privilege of hearing the camp director's story that centered on the hurricane. Her first summer was just prior to hurricane Maria in September 2017. We learned how God helped her prepare the camp that summer in ways that she didn't understand until after the fact. After the hurricane the camp was (in general) left in much better shape than the entire region. 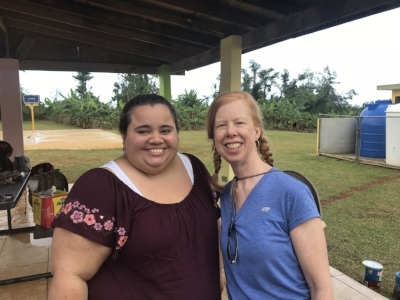 Camp director, Wilmari Vargas quickly saw God's provision to allow her to open the camp gates to help those in the greatest need. For months the camp supplied shelter, power (via a generator), washers and dryers, free ice and a center for community resourcing. This is the very short version of the story, but I am still thinking daily about how this one woman's faith and openness for God to use her continues to impact those that are in recovery mode. Listening to and working with Wilmari has certainly left an impression on me. At the base of the camp is the PCUSA church Iglesia Presbiterians El Guacio. They welcomed us with open arms for their prayer service on Thursday night. It's always a joy to worship as one despite our language disparity. Our group sung The Doxology as an offering of gratitude to God and the community we were in. On our last day we were able to tour the Western part of the island and engage in conversations about hurricane survival and continued efforts of recovery. We saw much physical destruction, witnessed families still living in public schools, talked to people that still didn't have electricity in their homes, stumbled upon the National Guard handing out water to a line of cars, and heard stories of the people that became 'the helpers' after the hurricane. This was quite a powerful day but the icing on the cake was the infectious happy spirit of everyone we came across. As typical of our travels we work out some of what we experience in our art. We have a Puerto Rico stole in the works. This is the base fabric. The gradations of happy blue to green is perfect to capture the land and sea and lovely personalities we got to know. Watch our Facebook, Instagram and eNews for the completed stole announcement! UPDATE: see the finished stole here!